For the amateur fisherman, it can seem a bit complicated to really get into the swing of things. There’s a ton of different types of rods and reels out there and actually settling down and picking one is a massive chore. If you’re looking to just dive into the sport without thinking too much about it, you’ve probably been tempted by rod and reel combos. The question remains, though, which is best for me? The thing you’ll need to do first is decide upon on what type of angling you’re going to engage in. If you’re looking for a general, all-around set-up you might want to look for something with a medium action pole and a spinning reel. True amateurs who are just looking for a few weekends a year at the lake will likely want to find something which is even simpler, and thankfully there’s a large number of high-quality spincast combos available for exactly this type of arrangement. Once you’ve decided on the type of fishing you’ll be doing, you’ll need to fit it into your budget as well. This is of special importance to the angler who doesn’t go out often, a marine fisherman who spends four evenings a week on the pier will receive more value out of a multi-hundred dollar rig than someone who’s just looking at a few weekends of fun. Look at the combination of tackle as an investment, the more you plan on fishing the greater your need for high-quality equipment. We’ve taken the liberty of tracking down three of the best combinations available on the market today. Hopefully, you’ll be able to find one below to perfectly suit your needs, allowing you to hit the water with a nice cast and begin a joyful experience in the world of fishing. This offering from Shakespeare is great for beginners. A lot of anglers begin with one of Shakespeare’s Ugly Stik rods, and many freshwater anglers come to swear by them. You know right out of the gate you’re getting a fantastic rod, but what about the reel? The reels that come with these are a pretty standard spinning reel, with some fairly high line capacity and three bearings. This isn’t a bad thing, though, it’s a perfectly serviceable reel right out of the box and depending on the size you decide upon you’ll be able to catch almost anything that will lurk in lakes and ponds. You may want to hold off on trying to catch your first alligator gar if you’re looking at this combo, but it’s perfectly suitable for most game fish. This option is probably ideal for the beginner, it comes in at a fantastic price and assured quality thanks to the brand. If you dive into the sport you’ll want a better reel pretty quickly, but the rod itself is a mainstay for a lot of anglers. If you’re just looking to test the waters, you could do a lot worse than picking up this high-quality, bargain-priced combo from Shakespeare. Let’s get it out of the way, Penn makes some of the best products available to anglers. The name is an absolute legend, and a set like this is an amazing way to jump into the game headfirst. This set is actually much more suitable for heavy fish than you’d think, although it’s not a specialized large game combo. The pole is medium-heavy in action and will fit your hand with an amazing amount of comfort. It’s a bit heavy for the most freshwater game, but if you’re planning on getting into marine fishing right from the outset it’d be hard to find a more highly recommended rod and reel combination. The reel is one of Penn’s cheaper offerings, but that’s not saying much as far as quality goes. It’s high capacity and features an impressive amount of drag for the size. It’ll stand up to marine fishing well, and it’s sure to last for a long time if you perform regular maintenance on it. For the aspiring marine angler, this set is especially tempting. Once you’ve got it in your hands it’ll be almost impossible to regret the purchase, and the bargain price means that it’s suitable for almost any budget. Zebco is the only company which really focuses on producing quality spincasting reels. This is probably because most experienced fishermen stick with the most advanced types of reel. That said, a spincast reel is absolutely the cheapest and best option for those who are just beginning and don’t plan on angling often. The reel is pretty standard Zebco fare. It’s cheap and durable and does everything it should do, which puts it a step ahead of some of the cheaper reels which can be had. This one is pretty lightweight, and so is the pole, so it’s not suitable for monsters. 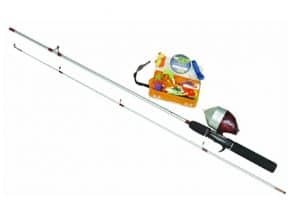 What it is suitable for is the beginning angler looking to catch some panfish on the weekend or a child just getting into the art of angling. This combo is perfect for the infrequent angler as well, the entire set comes in at less than $25 which means it’s less of an investment and more in the realm of preposterously cheap. This is the absolute best option around for the angler who doesn’t plan to spend a lot of time on the water but still wants some level of performance out of their tackle. If you’re unsure, take the plunge and have this one delivered, you won’t be disappointed. The most versatile combo here is the Shakespeare Ugly Stik GX2. The name and quality stand for themselves, and it has the most varied abilities of the rods here. For those looking to get into marine angling, however, there should be no hesitation in a quick purchase of the Penn Pursuit II. It’s serviceable for most marine applications and will become a welcome companion when it comes to fishing off rocks and piers. For those who are lukewarm about angling, there’s no better start than the Zebco combo. It’s also recommended for children who are just getting the hang of things since spincasting reels are practically fool-proof. 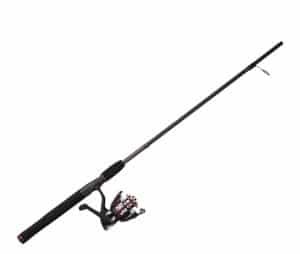 Searching for a rod and reel combo to meet your needs can take a lot of research. 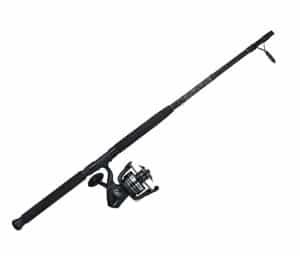 We hoped we’ve been able to guide you in selecting the rod and reel which will perfectly meet your needs. There’s no need to hesitate, with a simple purchase you can be well on the way to living out your own adventure while jumping into this exciting sport.